Based on the above graph the top of the market in terms of volume of transactions and value the top of the property market in Ireland occurred in Spring 2006. The developers may have realised this at the time and hence the last surge in employment in construction and also immigration during 2007 as they rushed to complete existing projects. I believe the number of planning applications also started to fall in 2006, so people were beginning to realise the game was up by then and daftwatch shows an increasing supply of property for sale from then on, does anyone know what the trend had been before that? Mortgage lending was €40bn a year or so in 2005 and 2006 , €30bn in annual liquidity injections have been removed from a €150bn economy since that time …which rather is a lot . Interior decoration ain’t what it was…just ask Izzy . Most of this decline has already occured you will be glad to hear meaning there will be a bettering in the pace of worsening from now on . It will not uptick until 2012 and then only anorexicly. … you will be glad to hear meaning there will be a bettering in the pace of worsening from now on . This is exactly what happened in the UK and we have since been hit with tsunami of ‘house prices rising’ stories. So volumes have collapsed (rarely mentioned) but the ‘average price’ has risen as a result. I would expect a full throathed media campaign to show house prices ‘rising’ again in the next 6 months. This aint over by a long shot Pinsters. What will it be like when the government removes an extra €25 bn or so? Remember that scene in Trainspotting…I just need one more ******* hit! I predicted sub €10bn mortgage lending and the consequences thereof on the PIN some years ago so this is all most unsurprising . It was €40bn a year or so in 2005 and 2006 , €30bn in annual liquidity injections have been removed from a €150bn economy since that time …which rather is a lot . Interior decoration ain’t what it was…just ask Izzy . Are you pushing your view of the timing of the bottom out a bit? 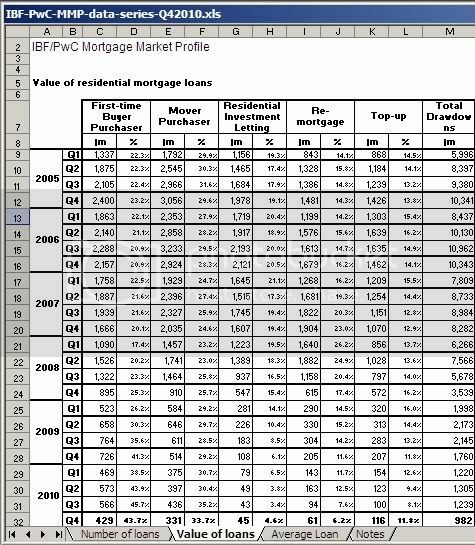 The IBF/PwC report on the Irish mortgage market published today shows that 12,189 new mortgages to the value of some €2.1 billion were issued during the third quarter of 2009 down 56.4% from 27,937, in the same quarter in 2008. Meanwhile, AIB today announced that it provided finance for 40% of all residential property transactions in the third quarter of 2009. Marian McCarville, Head of Credit Products, AIB Bank said: “While the demand for mortgage finance is still well below the levels seen in 2007 and 2008, AIB is continuing to see a steady flow of good quality mortgage applications from both first time buyers and those moving home. We have also seen a shift in the type of property that first time buyers are looking to buy in 2009 with sanction requests for second hand homes now the most popular category at 57%. Because of all this I now predict that Mortgage lending ( including topups and remortgages) will drop to €25Bn next year from €40Bn in 2006. Thats €15bn the banks will not be sloshing around the economy for starters . I revisited that late 2008 in a year when when the actual outturn was c.€23Bn and predicted max €12bn in 2009 it looks like €8.5bn will be the final number. Well the mortgage market next year will halve again ( including homechoice) ,to €12bn at the very most. The good news is that 2010 is the FIRST year in a long time where I am not predicting a halving or so in Mortgage lending . I now predict that Mortgage Lending in Ireland in 2010 will be around €6bn , in total . I remember reading it and I didn’t wade through the AAM thread, so it must have been on here. Some time about the collapse of Northern Rock, as I recall. I can’t prove it Yogan , I can only prove I predicted the following years trends reasonably accurately in advance …which is more than all the dept of Finance and Central bank could manage in fairness . I did hint at the 2009 out turn as early as April 2008 here where I pointed out the 2009 mortgage market ( less remortgages was likely to be sub €10bn . It will be sub €10bn including remortgages . 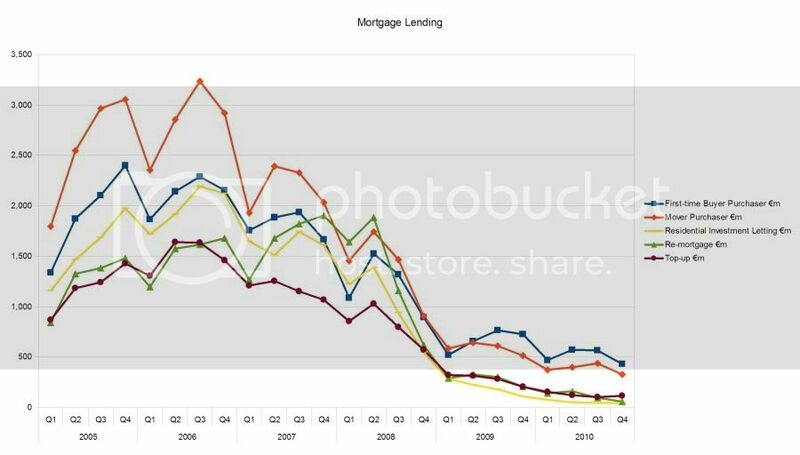 Mortgage volume down 43.5% Q4 '10 compared to Q4 '09, and down 22% compared to Q3 '2010. 40% fewer for all of 2010 compared to all of 2009. FTB and movers down just over 20%, while buy-to-let down over 50%. Although all five segments contracted in the fourth quarter, first-time buyers (FTBs) and mover-purchasers showed continued comparative resilience. Mortgage loans to the RIL and top-up segments increased in the fourth quarter – the first time both segments have increased since Q2 2008. When you are that low be prepared for some higher figures, probability favours it does not but heh, stranger things have happened. …Rachel Doyle, director of PIBA Mortgage Services, accused the State’s banks of “imposing very unrealistic criteria as a form of refusal” and said first-time buyers were struggling to get approval. Just who do these banks think they are, don’t they know that these FTB’s are entitled to get a mortgage. That graph really says it all. 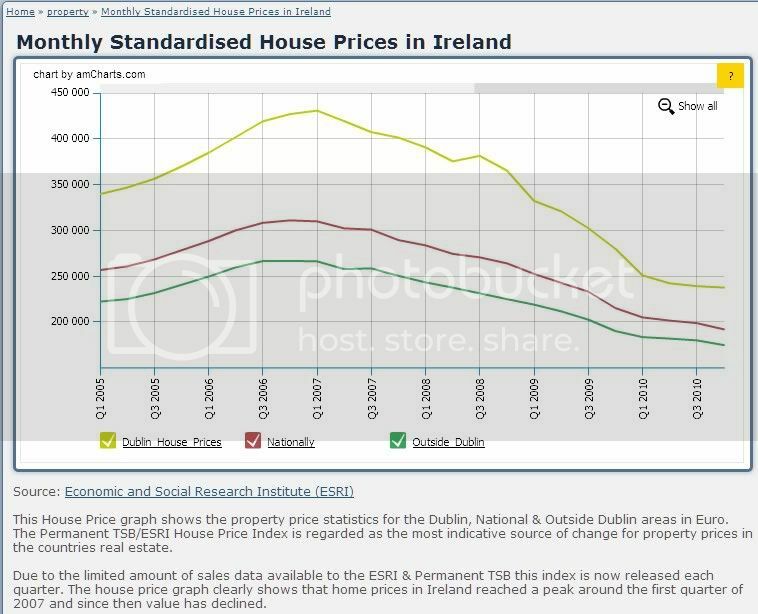 Is it too simple of me to believe house prices would have followed the same pattern (were it not for governmental interference in the market e.g. NAMA, rent allowance etc) ? amazing graph. Are figures available back to the 90’s?? Well, how else are people funding their house purchases? What would the banks books look like if night followed day? In 2006 they borrowed €40Billion short to lend long@AAA rates. And now? In 2010 they lent €6 Billion into the same market - what happens when you take 85% of the funding away? Bernie Madoff runs our banks. Bernie Madoff’s in charge of our Central Bank. Bernie Madoff’s our Minister of Finance. Bernie Madoff 's bailing us out.